Looking for a delicious, easy and good-for-your recipe that will feed 20 gazillion people at your Super Bowl party? Look no further my hungry friends. 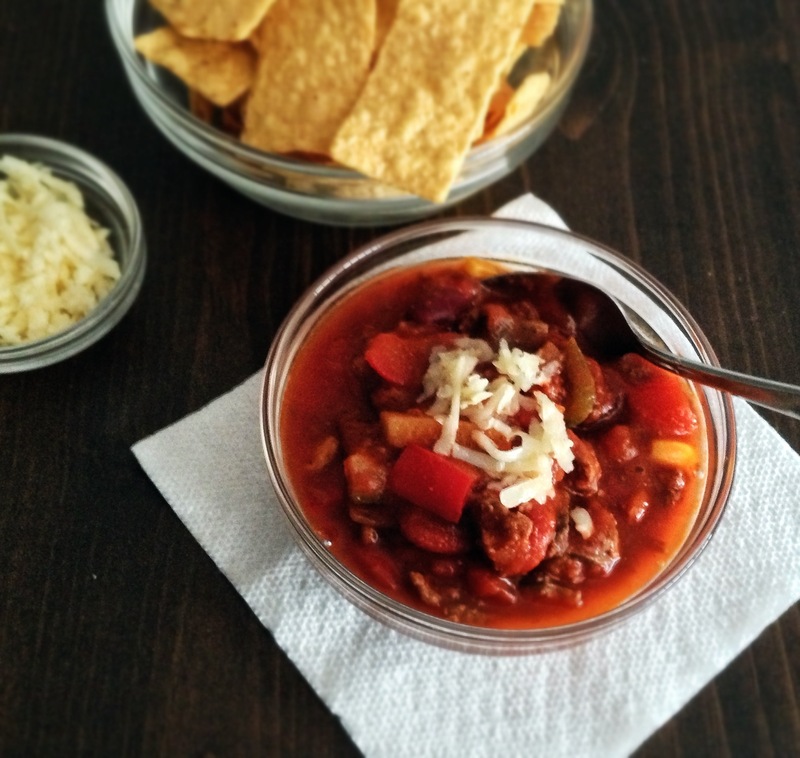 Make some chili. 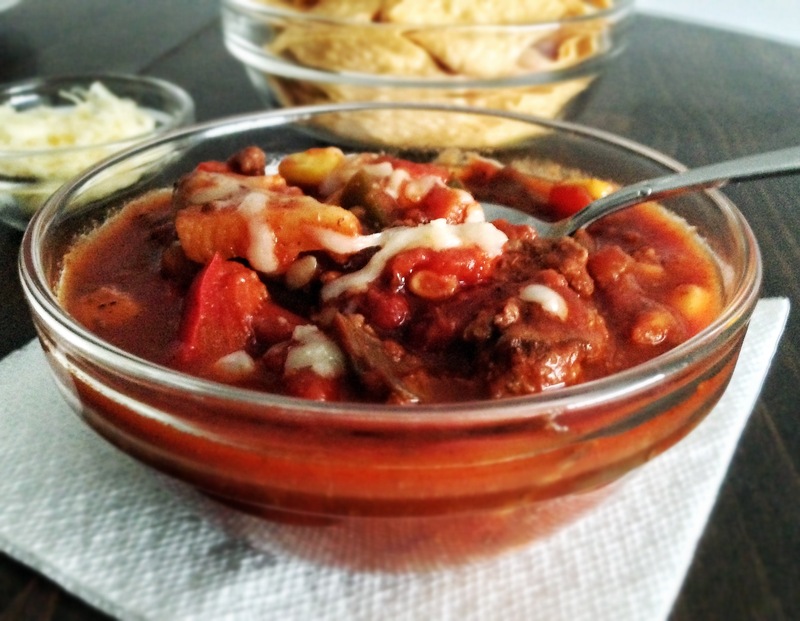 Specifically THIS chili. 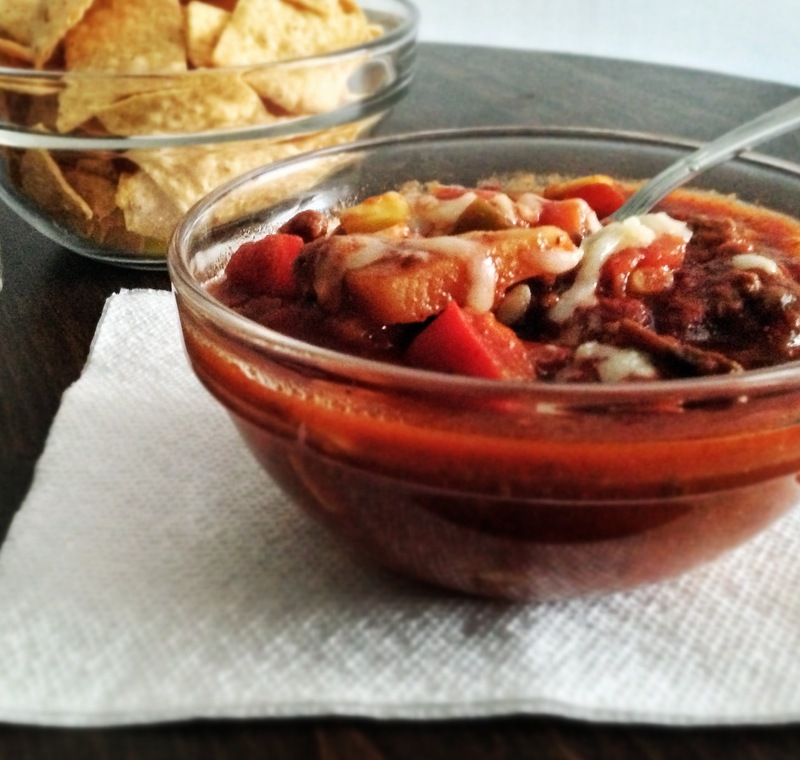 I call this my half-and-half chili. Half meat, half veggies! This is the perfect winter meal. It is hearty AND healthy. It will warm AND fill you up without filling you out. 🙂 And it will feed a hoard of people. 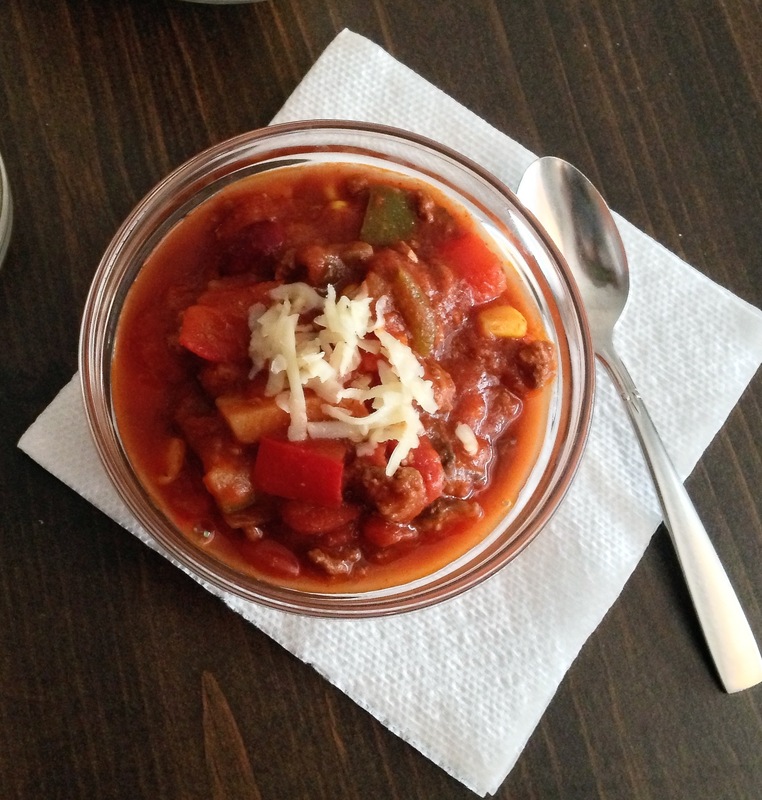 Along with ground beef this chili has an assortment of vegetables including hearty mushrooms, red and green bell peppers, meaty potatoes, zucchini, carrots and tasty corn. This recipe makes a TON. So you will have many meals and can even freeze some. 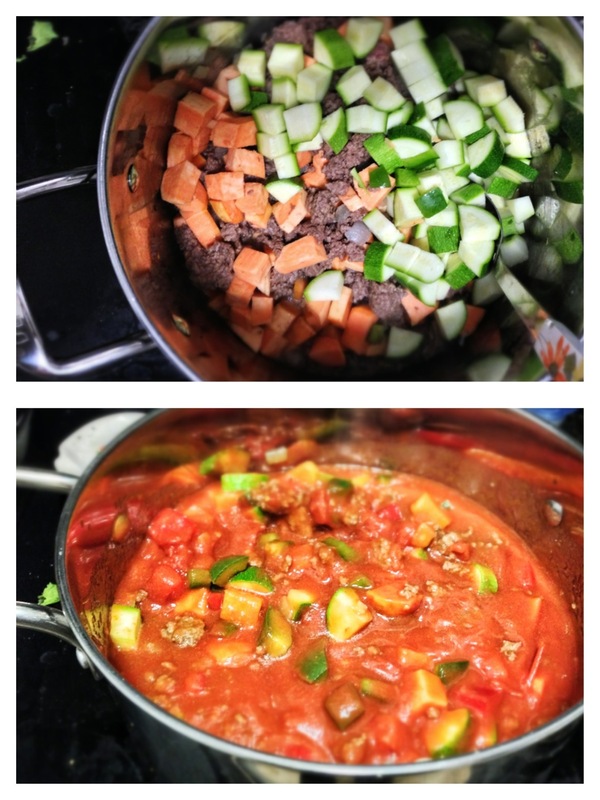 You can use the same veggies or use your a mixture of favorites! 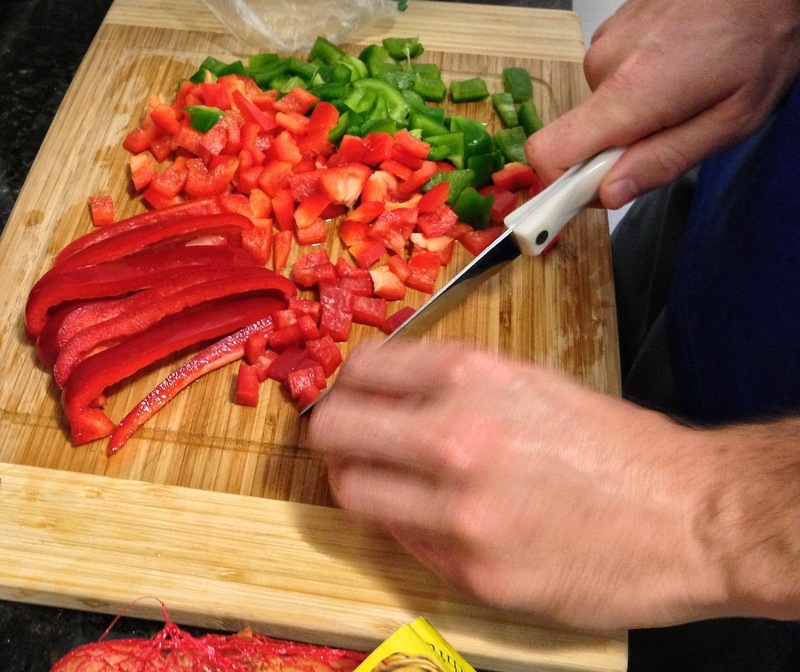 My Taller Half LOVES this chili so much he is always happy to help chop all the vegetables. Even if you’re not that into veggies, try this, I think your relationship with them will change. Now, I realize the amount of ingredients in this recipe totally goes against my mantra of “around 5-ish” ingredients. But it is done in 5 easy steps. And this is a “cook once, eat for a whole week” meal. The chili should simmer for a few hours to let the flavors fully develop (although you can dig into it after only 30 minutes). I usually make it the night before and think about dinner ALL day. How could you not think about this all day??? and then I eat it for leftovers for a week. OR be a good person a share: Have a Super Bowl party for 20 people and serve this! Plus, with all these veggies, you can top this with extra cheese and eat some extra chips and not feel guilty. You earned it by eating your vegetables. YUM! Look at that close up! 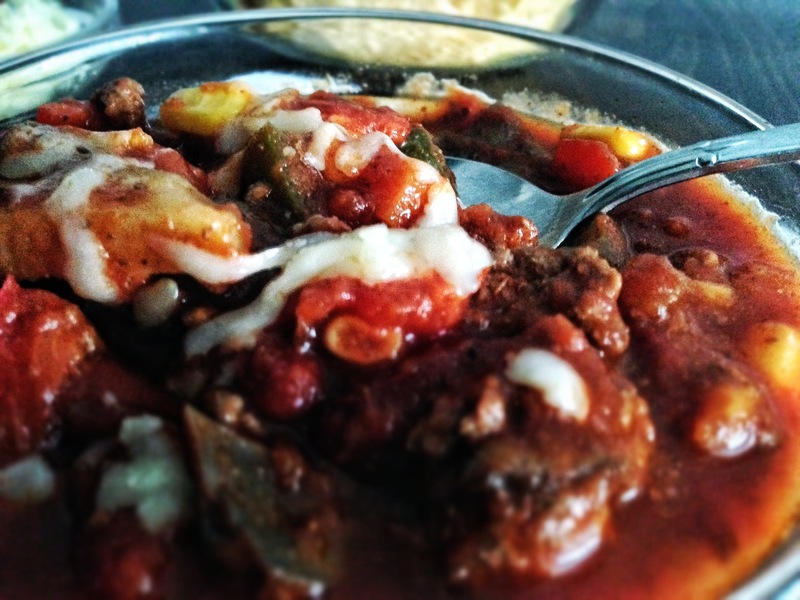 Meat, veggies and CHEESE!?! I’m in heaven. In a very large pot (~8-12 quarts) add step 1 ingredients and sauté on medium heat until onions are soft – about 3-5 minutes. Add all the veggies (step 3) and canned/frozen (step 4). Then add the spices (step 5) and stir to mix everything well. 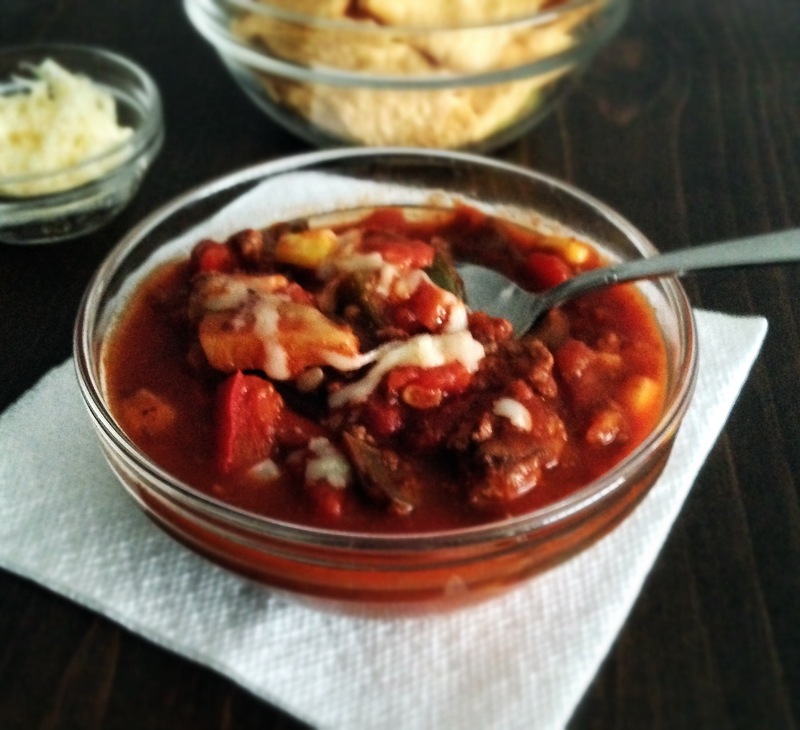 Simmer the chili for at least 30 minutes, but 1-2 hours lets the flavors develop. Tip: I usually make this the day before and simmer for 1-2 hours and then let the large pot cool before I place it in the fridge. The next day I take it right out of the fridge and let the pot come to room temp and then simmer to warm it up and then serve. This is a great make ahead meal. Top with shredded cheddar cheese, sour cream and enjoy with chips or corn bread! 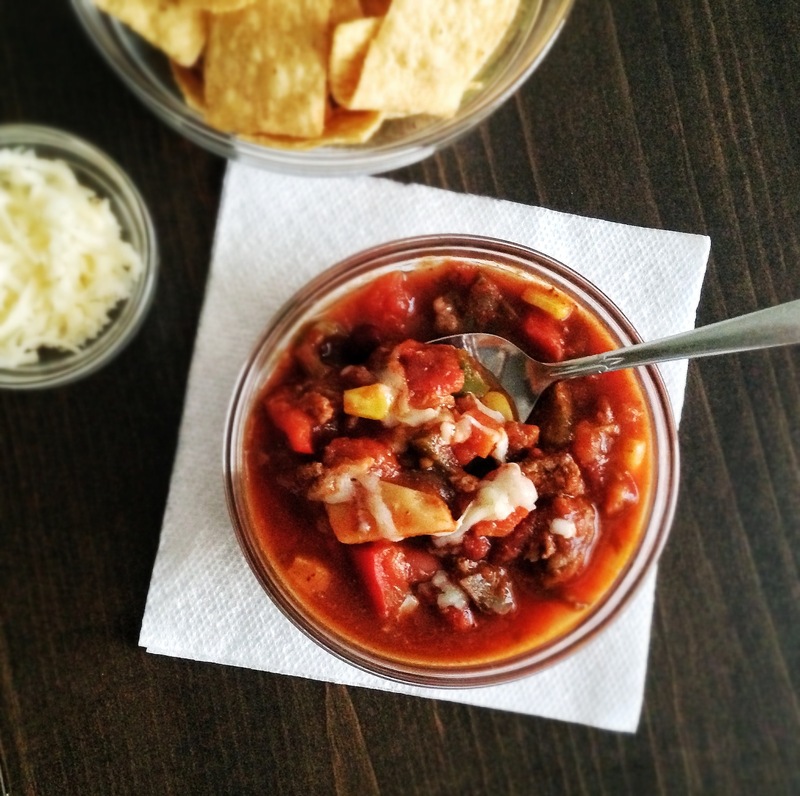 Chili can be stored in airtight container the refrigerator for 1 week or up to 3 months in the freezer.